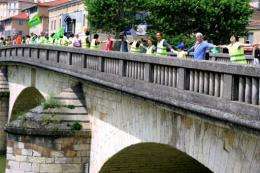 French citizens form a human chain to protest against the exploration work of shale gas in May 2012 in Auch. France has no intention of lifting its ban on shale gas exploration because of continued concerns over its environmental impact, Environment and Energy Minister Delphine Batho said Friday. France has no intention of lifting its ban on shale gas exploration because of continued concerns over its environmental impact, Environment and Energy Minister Delphine Batho said Friday. "The government clearly and distinctly maintains the ban on exploiting shale gas because nowhere in the world has it been proven that this exploitation can be done without significant environmental damage and important health risks," Batho told BFMTV. "Nothing in the government's agenda today foresees a reconsidering of the ban on hydraulic fracturing," she said. French lawmakers voted in June to ban tapping gas from shale rock using a technique called hydraulic fracturing, or "fracking", which has raised concerns about spills, leaks and contamination of groundwater. Little-known even five years ago, natural gas trapped in sedimentary shale rock is seen as having the potential to transform global energy markets. But moves to tap it have sown deep divisions in Europe amid concerns the hydraulic fracturing process used to extract it is environmentally risky. The president of France's UFIP oil industry body Jean-Louis Schilansky told AFP he hoped the issue was not permanently closed to discussion. "We registered the minister's statement. But we hope that a debate can take place," he said. Along with Poland, France is considered to have the most potential in Europe for shale gas exploitation. When the Euro finally collapses, the French will not have much choice as they will need to bolster the value of their new Franc. Good call. Though the motive behind it is probably not any environmental concerns but the nuclear lobby. France has no environmental movement to speak of.